This ribbon works together with the acquisition tab, which is for spectrometer control and live data acquisition. 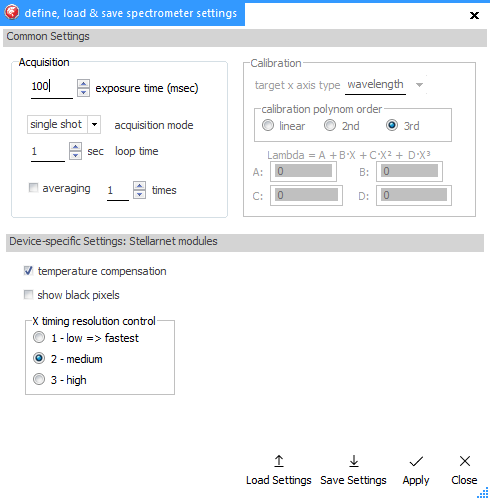 Here you can connect to a variety of spectrometer types, set acquisition parameters, acquisition and measurement modes, execute x axis calibration and define live post-processing steps. All parameters and settings can be changed on the fly, even during continuous acquisiton, and effects will be immediately visible. 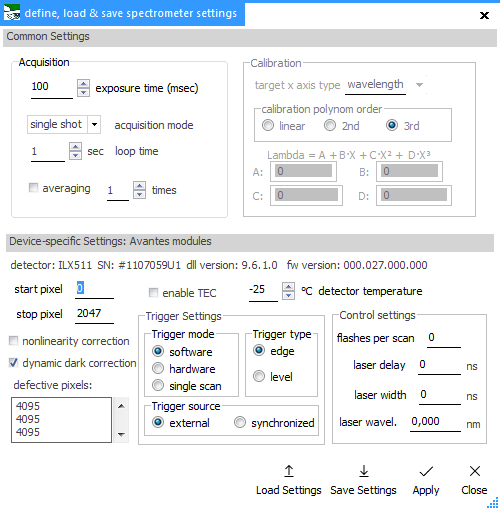 Create a new Acquisition view as the tab for spectral data acquisition from spectrometers. It is possible to connect to several spectrometers by creating several acquisition tabs. The acquired spectra can be handled and processed in all ways just like "normal" spectra by using all the normal functions available. The acquisition tab behaves like a normal Spectra tab, with live data acquisition added. As a first step, always select the device type from the "Device type" list. Currently, there are: Andor cams, Avantes, OceanOptics and Stellarnet spectrometer modules and USB webcams. The dropdown list below shows the available devices to select from, if there are more than one devices attached. Only after successful selction of a device type does it make sense to actually connect to a device with the [Connect] button. The connector image will change after successful connection to a "plugged" state. The desired exposure time can be set anytime (in milliseconds) and will apply to the next spectrum acquisition. This gives access to multiple parameters at once and allows to save them together as "Spectragryph acquisition settings" file (*.sgas). This file can be loaded again and applied to the currently connected spectrometer. The upper part give access to parameters that are common to all devices, like exposure tome, loop time, acquisition mode and averaging. On the right, there are the calibration coefficients and designated axis types used for x axis calibration. This part is disabled for spectrometers that have their calibration onboard. The lower part of the window gives access to device-specific settings. After entering or loading parameters, they can be put to use by clicking the [Apply] button below, or changes can be ignored by closing the window again with the [Close] button below. access to webcam settings is provided by a MS Windows dialogue, that may look different between OSes. Exposure time is often not accessible. At least you can prevent clipping by controlling "Brightness" parameter. The selected measurement mode defines the y axis type of the measured live spectrum, with one or more auxiliary spectra needed, depending on the chosen mode. As auxiliary spectrum, there can be dark, reference and Blank spectrum, while each of those can be set, removed and viewed anytime. As soon as these are assigned, they are kept behind the scenes for further use. To update any of them, set them again with a newly measured live spectrum. The dark and the Blank spectrum type are optional, so their use has to be activated by clicking onto the respective button. Reference spectrum is mandatory for each y axis type except intensity, so it is used automatically, when necessary. Each one should be measured again after changing exposure time. Reference should be measured again after any changes in the excitation light intensity. If "averaging" is checked, the defined number of raw spectra gets averaged, before being shown as live spectrum. 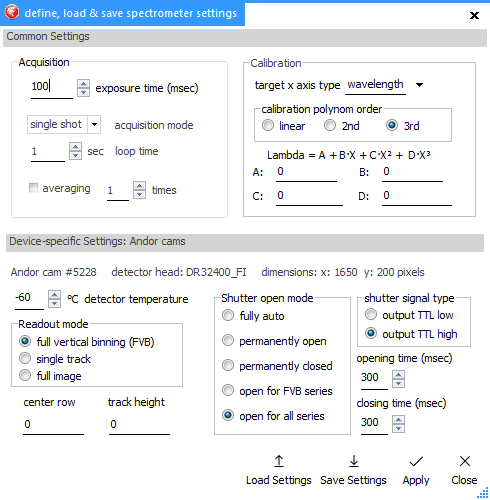 After measuring an appropriate spectrum, open the calibration dialog from the "calibr. x axis" button's drop down menu. In the upper field, select the spectrum to be used. Change the peak finding threshold, if necessary. Select the desired x axis type after calibration on the right side. Below are the fields for the calibration coefficients, that result from the calibration process. In the table below, the x axis positions of the found peaks from the selected spectrum are displayed. You can either enter the known positions into the "desired position" column manually, or select from a number of precompiled positions that are shown as dropdown list. 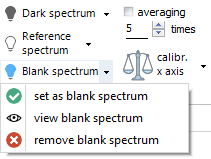 The content of this dropdown list depends on the calibration source chosen above. Only the "custom" option allows to manually enter position values. Check the values to be used during calculation. 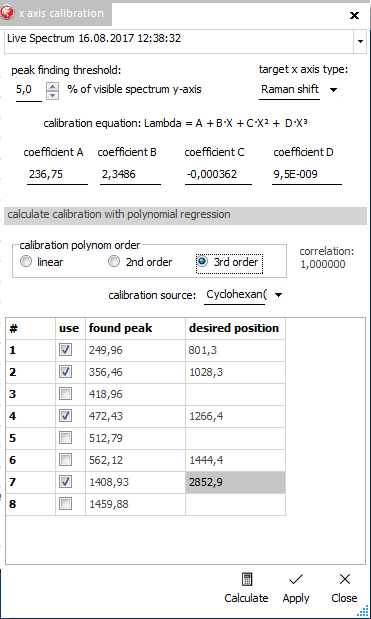 Finally, select the polynomial order for the regression calculation and press the "Calculate" button. The calculated calibration coefficients will show up in the respective fields above. To keep the coefficients and the set target x axis type, use the "Apply" button below. 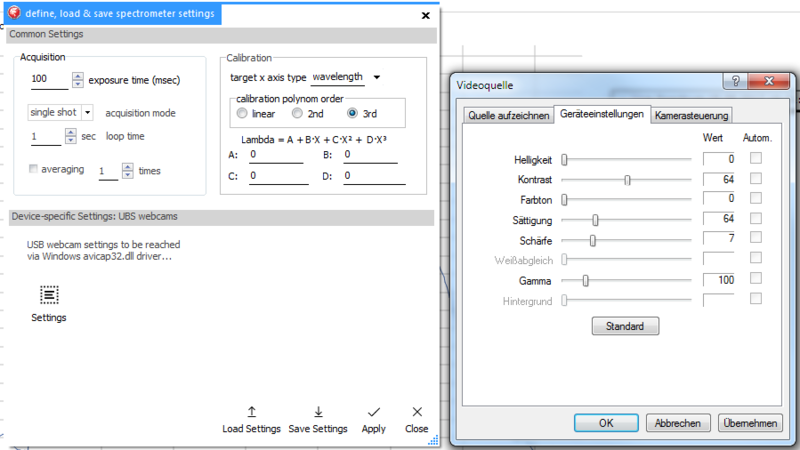 The peak data for the selectable calibration sources is in a file called "calibration_lines.csv" in the program folder, this file's content can be changed to adapt or enhance the range of available calibration peak data. Turn the calibration-induced axis transformation on/off with the "calibr. x axis" button. This can be done on the fly while measuring. HINT: To better find the peaks to be used during calibration, you might turn on "Peak labels" before starting the calibration procedure. ANOTHER HINT: The calibration coefficients are saved and loaded together with other settings from the "Settings" dialogue. All the parameters and settings described above affect the acquired raw data before being shown in the plot. Therefore, they get active with the next acquired spectrum. 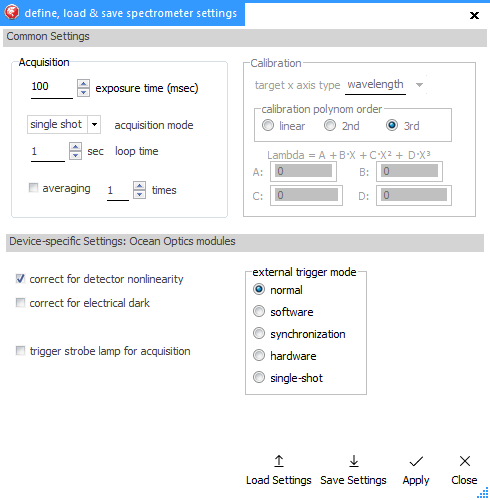 The post-processing options however affect the displayed live spectrum, so the differences while turning them on and off are directly visible.